Jeb Bush’s Trump attack ad: Why the establishment favorite’s newest assault on Donald Trump could backfire. Don’t poke the strangely coiffed bear. 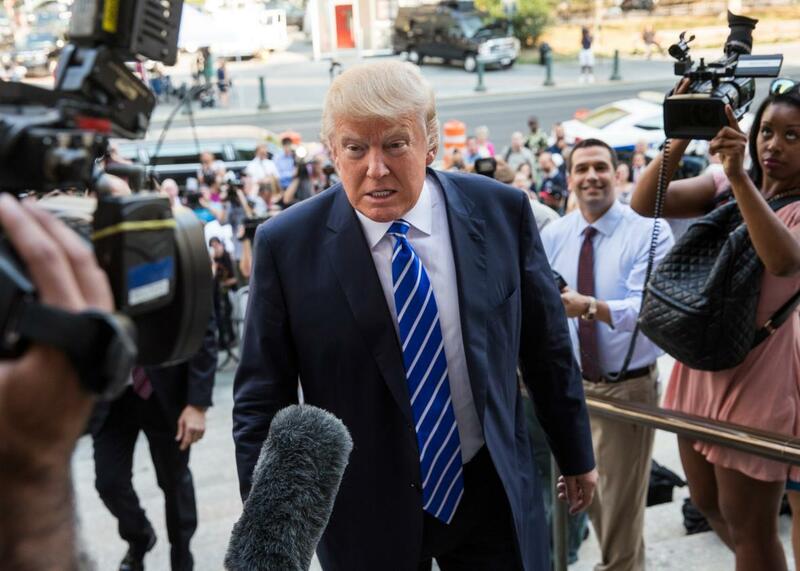 Above, Donald Trump arrives at Manhattan Supreme Court to report for jury duty on Aug. 17, 2015, in New York City. Jeb Bush on Tuesday launched his biggest attack yet on Donald Trump with a new video that paints the current GOP front-runner as an out-of-touch New Yorker who has no place in the Republican Party. Bush’s “The Real Donald Trump” attack ad—a play on Trump’s much-used @realDonaldTrump Twitter handle—uses the billionaire’s past statements to paint him as a liberal elitist in a conservative candidate’s clothing. “I’ve lived in New York City and Manhattan all my life,” Trump says in the clip that kicks off the spot. “OK? So, you know, my views are a little bit different than if I lived in Iowa.” The 80-second ad then proceeds to show footage of the real estate tycoon praising everything from single-payer health care to President Obama’s stimulus package to Democratic front-runner Hillary Clinton. Trump’s faced similar Republican-in-name-only criticism before. Megyn Kelly and co. grilled him on his liberal past during the Fox News debate early last month, and Bush and other GOP hopefuls have been increasingly trying to paint him with a Democratic-branded brush of late. Such criticism, though, has failed to strike a chord with Trump’s unique band of supporters, many of whom appear more attracted to the businessman’s anti-establishment anger and brash bluster than his specific policy views. When a well-known GOP pollster recently showed a focus group a few of The Donald’s greatest hits—which included his support for single-payer health care—Trump supporters reported liking their man more than they did before they saw the footage. So is Bush’s RINO-themed attack doomed to fail? Not in the long run. Trump has a sizeable lead in the polls, both nationally and in the early nominating states—but what he doesn’t have at the moment is enough room to grow his base to remain out in front once the field begins to winnow and his party rallies around one of his more establishment-friendly rivals. Bush, then, needs to keep Trump’s current ceiling in the polls in place. Reminding non-Trump conservatives of his liberal past should help do just that. Bush’s gambit, though, comes with significant risks. As Lindsey Graham, Rick Perry, and Scott Walker can all attest, GOP hopefuls who tangle with Trump this campaign cycle rarely get the better of it. If Jeb has any doubts about just how low Trump is willing to go to take him down, he can head on over to Instagram and watch Trump’s brutal “Willie Horton”-style attack ad that went live on Monday and overlays Bush’s “act of love” quote about immigrants who come to the United State illegally on top of mug shots of alleged murderers. The bigger danger to Bush, though, is also in the long term. The Summer of Trump has been dominated by questions of how long the billionaire’s run atop the polls can last, and whether his GOP campaign will end with a bang or with a whimper. The more important question that looms, though, is whether Trump will launch a third-party bid if or when he’s knocked out of the GOP race. If the former reality star decides to stick around as an independent, he’s likely to hand the general election to the Democratic nominee. It’s a fool’s errand predicting what Trump will do next week, let alone next summer, but two of the things that the billionaire has been the most consistent on this year are that he doesn’t suffer slights in silence and that he clearly is not a fan of Bush. If Jeb has to tear down The Donald to win the Republican primary, then, he’s more likely to find Trump still standing in his way come the general election.